These trousers have a built in concealed harness so you can set up and swing from any suitable tree you might come across on your travels. The classic pair of braces are thrown over a branch then re-connected to your trousers. Micro light carabineers unclip from belt buckles and attach to D rings to form a swing. The webbing loops located on your thighs allow many alternative positions. The braces are also fully adjustable and can be used in a variety of locations. The recreational trouser provides immediate excitement. Random connections to public environments provide stimulation and site specific performance. Experience public space as a vast playground. 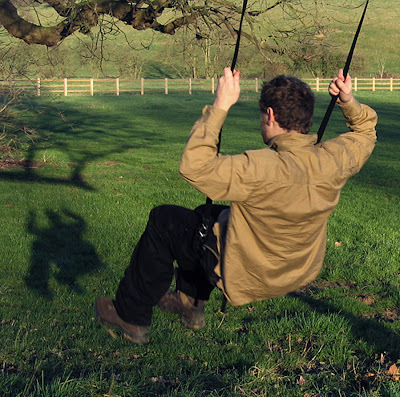 The Swing Trouser shares similar ideology to urban free runners.